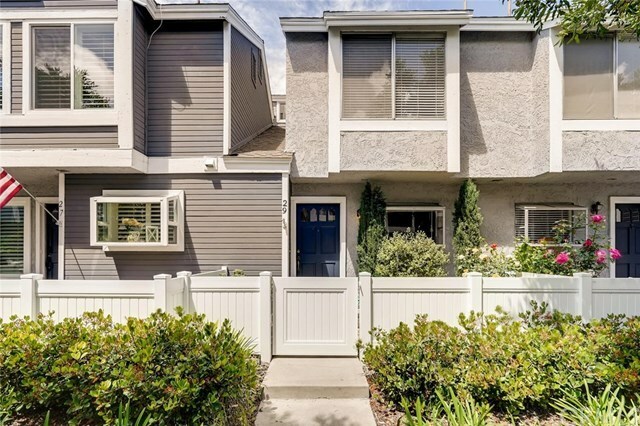 Beautifully upgraded 2 bedroom 1.5 bathroom, highly desired two story condo in Aliso Viejo now available! Great location in the Morningside Terrace neighborhood. This condo features all bedrooms up with full bathroom and a half bathroom downstairs. Outside features a front patio, a back patio, and a deck! Inside you will feel at home with a open floor plan dining room and living room with a fireplace. The large master has vaulted ceilings, and a view of the pool. Recent upgrades include new countertops in the kitchen and bathroom, new travertine stone floors, new carpet upstairs, new AC and thermostats, and newly painted! Live 15 minutes from the beach! The community features a pool, spa, barbeque, and ample guest parking!